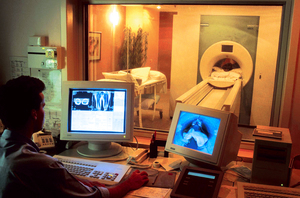 Patient undergoing MRI scan in Westmead Hospital, Sydney. CSIRO scientists have developed software which uses powerful mathematical analysis to measure the extent of thinning in the outer layer of the brain known as the cortex. This thinning is a factor associated with the onset of many neurological disorders, and this software will aid in the early identification of diseases such as Alzheimer's and schizophrenia. The software takes images from routine magnetic resonance imaging (MRI) and uses them to create a three dimensional map of the patient's brain.